Arrows lead to questions, which we tackle here! In the course of providing hundreds of tuning and equipment seminars to thousands of people across the globe over the past three decades worldwide, I’ve noticed that no matter where they are in the world, many archers have many of the same equipment questions. Those questions run the gamut, from arrows to tabs, and much more. Knowing this, the editors have asked me to put a list together and discuss some of the more common questions. So in no particular order, here are some of the questions- and answers- that seem to come up over and over again just about everywhere! What advantage does the X10 have over other shafts? Are there any disadvantages? There are several advantages- the smaller diameter of the X10 shaft presents less surface area and a smaller cross section, which is very helpful in windy conditions at longer distances. The X10 is also designed with three distinct, custom spine zones- and specifically, a less stiff and- importantly- lighter tail section, which improves clearance and finger release consistency, compared to the much stiffer and heavier tail sections of parallel shafts (or even so-called “tri-spine” shafts from other makers). 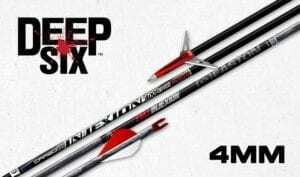 Most importantly, the X10 has a high ballistic coefficient – it correctly balances mass weight and momentum for better performance from recurve bows at longer distances, especially in windy conditions. The main disadvantage of the X10 is the fact that smaller diameter arrows at higher momentum potentials require better target materials to help prevent excess penetration or pass through. Another factor is that more care is needed when gluing components, which is also due to the small diameter. For the same reason, removing points requires a little more care and time in order to avoid overheating. Also, the cost to produce the X10 is considerably more due to the materials and techniques required to hit the required tolerances. What’s the effect of cutting an X10/ACE from the rear/How come there’s no chart to tell us the effect/Why doesn’t Easton recommend cutting these shafts from the back? What is the best centershot setting for the X10? A common error made by intermediate shooters using X10 shafts is that they apply “textbook” centershot settings to the X10. These settings work fine for the shafts weaker than 650, but for stiffer shafts, less centershot is needed than for ordinary parallel shafts. This is because of the relatively large barrel on the shaft. The larger size X10’s tend to dynamically self-compensate for centershot and so generally they should be aligned closer to center than conventional shafts. A simple walk-back test can be used to confirm the correct setting. Why are there “weight codes” on high end Easton A/C shafts? Is this important? With aluminum arrows,, the specific stiffness- the stiffness for a given mass of material- is always exactly the same for a given alloy. The great thing about aluminum arrows is that you can get shafts to exactly match ones you had 20 years ago and 20 years into the future. It’s generally not so with carbon fiber arrows, which have a significant stiffness variation in production compared to aluminum. In order to cope with this, Easton first specially selects the carbon fiber and does a few proprietary things to eliminate as much of this variation as possible, and then they build shafts of the exact same spine (static stiffness). Since there’s some variation in the carbon from batch to batch, some shafts of the exact same spine might still be a few grains lighter or heavier than others. So, Easton goes to the trouble of exactly weight sorting the shafts, putting them in weight categories (C1, C2, etc) to ensure that not only do you have a perfect spine (which is the most important consideration) but the shaft weights are uniform as well. In addition, they further ensure every dozen shafts are within 0.5 grains. Frankly, Easton overdoes this a little bit- there’s so little difference (potentially, none after cutting) between a batch of, for example, category C3 arrows and a batch of category C4 arrows, that once cut, assembled and fletched, they can be mixed with no issues. How do you find the best brace height for the recurve bow? Use your ears! More often than not, the “best” brace height for a given recurve bow is where that bow shoots most quietly. Unsurprisingly, this is usually well within the manufacturer’s recommendation range. Remember, some bows, when braced too high, can become very “twitchy” with respect to vertical stability. Too low, and armguard/wrist contact may increase considerably. 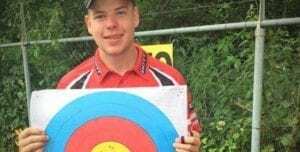 How much point or shaft should be ahead of the plunger at full draw for recurve? For a variety of reasons outside the scope of this article, the answer is that at least two centimeters of shaft (not including point) should be past the plunger center at full draw. More is OK within reasonable limits, but less should be avoided when practical. What size of tab should archers use? Tab sizes are generally similar to dress glove sizes. If one uses a small glove, generally a small tab will do the job. The important thing to remember is the string should not strike the fingertips on release- if it does, it’s likely that the tab leather is too short. What leather thickness should a tab be, or how many layers should an archer use? This is an individual issue for most, but as a general guide, comfort is important and the tab layers should be thick enough to prevent finger pain. Sometimes, it is possible to get more comfort with fewer layers- for instance, two layers of Cordovan feels about the same as one layer of Cordovan, one layer of thin rubber, and one layer of suede. However, the two Cordovan layers are thinner overall, last longer, and often behave better in wet weather than a solution incorporating suede backing. How long or short should the leather be cut on a tab? Some top shooters never trim their tabs at all, while some others cut it to the bare minimum. You can determine the minimum cut length for your (broken-in) tab by heavily dusting it with talc (baby powder), shooting a few shots, and looking to see where the talc has been scraped off by the string. Usually, a point about 3-4 mm past this ridge of powder represents unused leather which can be trimmed. 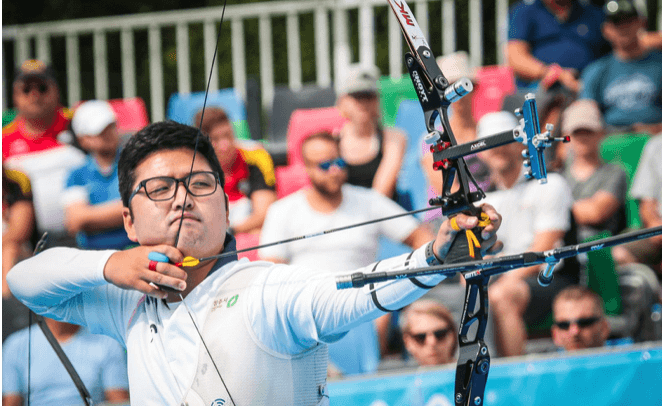 However, it’s worth noting that Korean star Park, Sung-hyun’s incredible 1405 FITA World Record score was shot with a completely untrimmed Cavalier tab with a cordovan face. What size of finger spacer is advised? This depends on so many variables that it’s hard to give a blanket answer. However, one should avoid the use of a too-thick spacer, or one that causes pain. Spacers should be modified as needed to eliminate pain, or even discarded in cases where they cause problems. 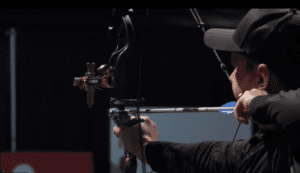 Why do so many archers make alterations to their grips? One reason is that it has become quite stylish to imitate the grips of top shooters. Changing grips is for some a fun activity and it usually has immediate effects (good or bad!) So, it has become quite popular to adjust the grip. The problem is that a lot of people don’t understand all of the issues that manifest themselves when they make big changes to their grip. For instance, going from a neutral to a high grip changes much more than just the wrist angle- it affects effective draw, shot timing, bow dynamics, and much more! Interestingly, a number of top shooters shoot unmodified factory grips exclusively. One reason is that it’s hard to get two custom grips that feel exactly the same. Next time, we will look at stabilizers and some of the common questions we get on that popular subject.